Expect thunderstorms across the area this afternoon and evening; warm, moist, unstable air across SE MI will contribute to storms developing quickly and without much warning. (We’ve seen this already today with this line of storms.) The principal risks with these storms are probable damaging wind gusts and large hail, with a slight risk of isolated tornadoes. Also expect locally heavy rainfall. We have a slight risk of some of these storms becoming severe, particularly in the late afternoon. POSSIBLE AS STORMS MOVE FROM SOUTHWEST TO NORTHEAST AT 30 MPH. DECREASING DURING THE OVERNIGHT HOURS. NWS Detroit notes that the episodic nature of these thunderstorms creates forecasting challenges in regards to exact timing. 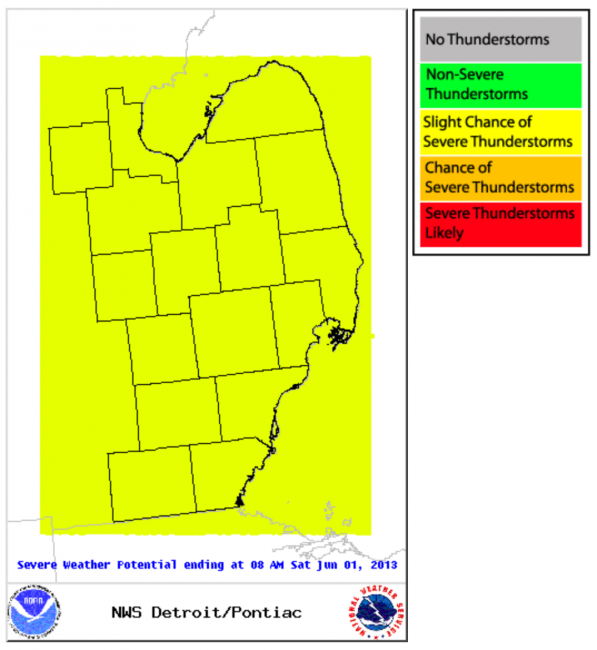 Additional reading: NWS Detroit briefing slides for today. We’ve already seen one severe storm in the area, and as more storms continue to develop over the next 10 hours, some will be severe. Our outlook today shows us at slight risk for severe convective weather; a 15% chance of large hail; a 15% chance of damaging wind; and a 2% chance of tornadoes. Looking forward, the SPC’s thunderstorm outlook for 4-8pm shows us around a 40% risk for thunderstorms; I believe this is conservative given what we’ve already seen today. From 8pm-midnight, they show us just outside a 40% risk area, and again from midnight-8am; again, I expect thunderstorms in are area at least through midnight.